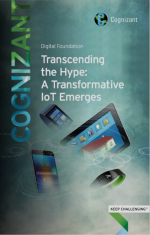 Ghost writer for "Transcending the Hype: A Transformative IoT Emerges" in Cognizanti Journal (Volume 8, Issue 1 - 2015), in which I articulate Cognizant's point-of-view on the Internet of Things. Despite the hype, our observation is that the Internet of Things is finally taking shape at companies across industries. Initial pilots offer a glimpse of how a tightly interconnected physical and digital world can drive breakthroughs in customer experience, worker productivity, and entirely new product models that radically alter competition. 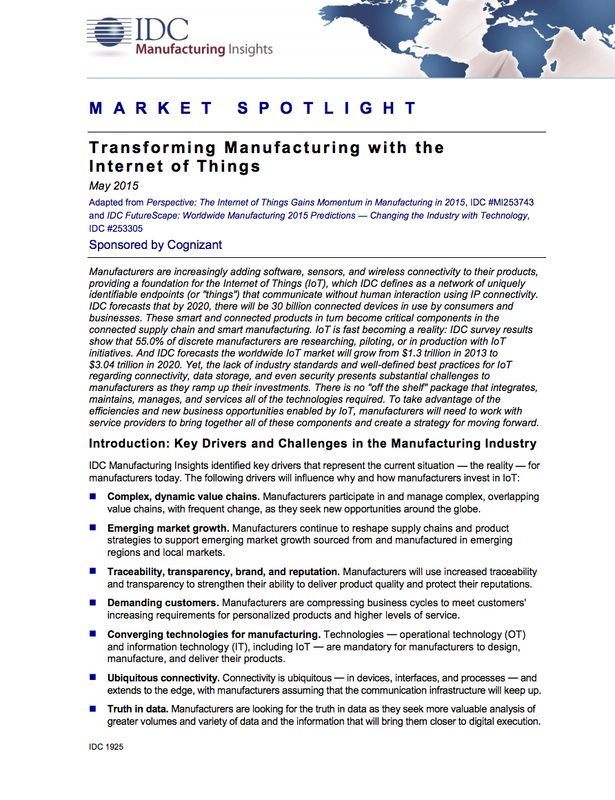 I worked with an IDC Analyst to create a sponsored piece of thought leadership for the manufacturing sector, entitled "Transforming Manufacturing with the Internet of Things". Part of my job as a product marketer is to drive influencer preference for Cognizant, and one meaningful way to bring a new perspective to market is to leverage the research of analyst firms. Working with analysts to get candid feedback on positioning and messaging, or as colleagues on a perspective can be a strong differentiator in building awareness and generating interest. In this case I provided the outline of the narrative and worked with the analyst on several drafts until the finished piece. 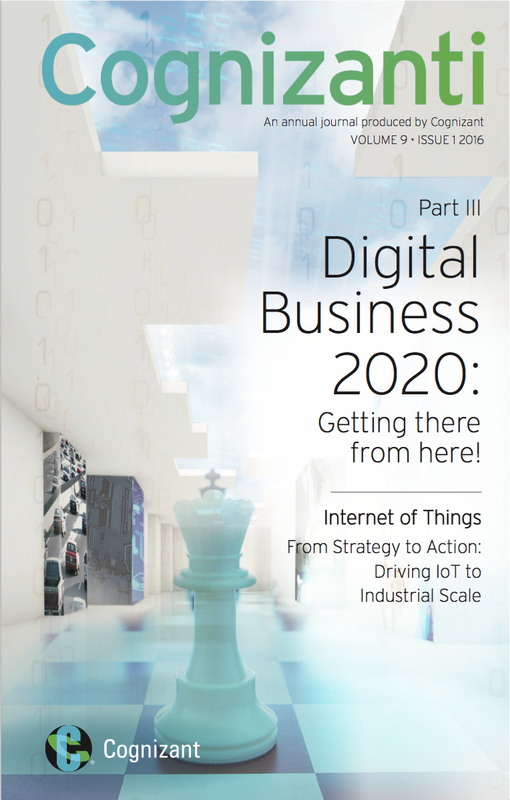 Ghost writer for Cognizant point-of-view on the evolution of IoT in Cognizanti Journal (Volume 9, Issue 1 - 2016) , and how companies can get beyond instrumentation and take action to build IoT solutions that scale. To get past pilots and proof-of-concepts, companies needs to build IoT at scale to realize the true business value of smart, connected products, processes, and places. We outline specific strategies to overcome challenges to IoT scale. Contributor and reviewer for this piece on Intelligent Automation in Cognizanti Journal (Volume 9, Issue 1 - 2016).